More than two decades ago, thirty people formed an “urban planting” from Akron Mennonite Church and were blessed with what was to become Community Mennonite Church of Lancaster. In 1984, Lancaster Church Planting Fellowship began planning in borrowed space from the Lancaster Opera Workshop. Two years later, in January of 1986, fifty-nine charter members from Lancaster City and the vicinity signed the first church covenant. Shortly thereafter, the congregation moved to its church home at 328 W. Orange Street. 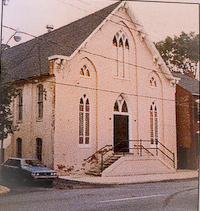 The original church building, affectionately referred to as the “Pink Flamingo”, had been used for 22 years as the Theobald School of Ballet. For years after its use a dance studio, the building had languished and was slated for demolition in 1986. Local public awareness of its historical importance was raised and the building now stands as an example of historic preservation and adaptive reuse. The newly formed Community Mennonite Church of Lancaster, hired its first pastor, 27 year-old Vernon Rempel, in 1986. The unique spirit of CMCL evolved and grew embracing the arts and a delight in the unexpected. The colorful wooden parrot, that sits in the sanctuary, is a symbol of that spirit. Community Mennonite’s facility now accommodates an active Christian Education wing, an art exhibit called the Parrot Gallery that is a “First Friday” destination, and numerous other worship and fellowship spaces. Through CMCL’s active mission in neighborhood engagement, the building is now being shared with new church plantings, several support groups and others. Today, more than 450 people currently attend two worship services and many more stay connected to this vibrant spiritual community.